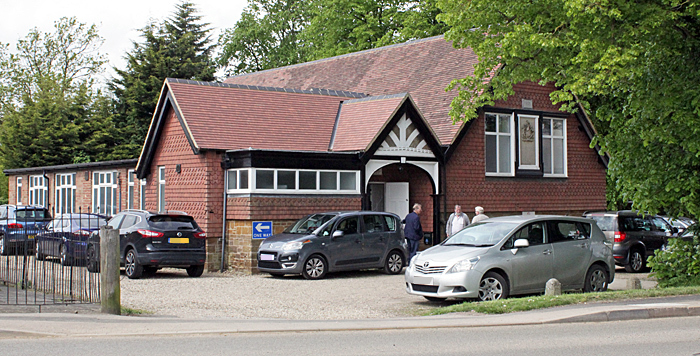 The 2018 Annual General Meeting of the Postal Microscopical Society was held as usual in Turville Memorial Hall in Husbands Bosworth, Leicestershire, about 6 miles from Junction 20 of the M1. Lots of Quekett members also belong to the PMS, so there were many familiar faces. 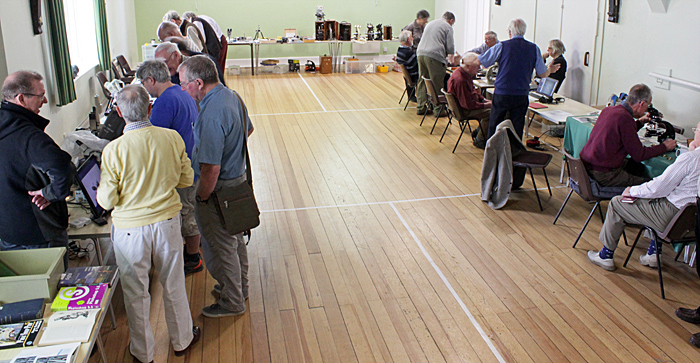 In the morning there were tables all round the main hall and overflowing into the committee room with exhibits and sales, followed by the AGM. After a break for either a packed lunch or lunch in The Bell Inn across the road, there were 4 presentations in the afternoon. Brian Wilkinson used his Zeiss Standard to demonstrate VAC 2 (variable amplitude contrast), and provided lots of photographs for us to admire, notes on the technique, and explanations of how to make the stops and insert them in a phase contrast condenser. http://www.postal-microscopical-society.org.uk/ → Colour Supplement → Balsam Post Issue 91 (April 2011) → pages 12–21 “VAC Contrast”. If you would like a copy of Balsam Post 91, where Brian gives details of making and using VAC stops, Mike Samworth has some available. Colin Lamb showed a book by Michael Shaw (Your microscope hobby: How to make multi-colored filters: Rheinberg, polarizing, darkfield and oblique, ISBN 978-1511421478). The book has black-and-white illustrations but includes a link to a colour version that can be downloaded. Joan Bingley grows her own asparagus, and at this time of year it is attacked by beetles (Crioceris asparagi). 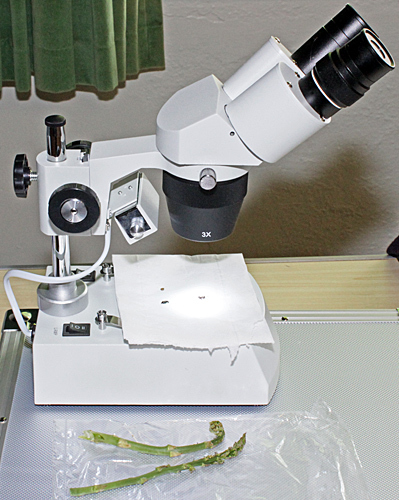 Joan brought a stereomicroscope so we could examine asparagus spears, a beetle and a spider. Mike Gibson showed his Lomo Biolam С1Ч42 and МБР-1 microscopes with illumination provided by a hemispherical LED light, available for just £3 and fitted with an on/off switch. Power came from a power bank available from pound shops. Mike also brought 2 books of his excellent photomicrographs. 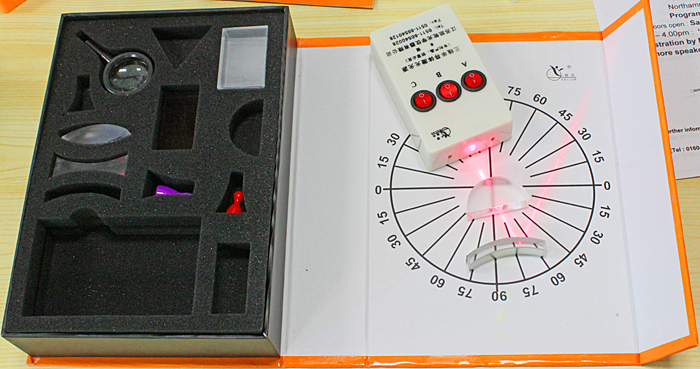 Mike also showed a cheap optical demonstration kit that includes lenses, prisms and blocks and a light source that emits 1, 2 or 3 beams of red light. The instructions are in Chinese, but there are some pictures. 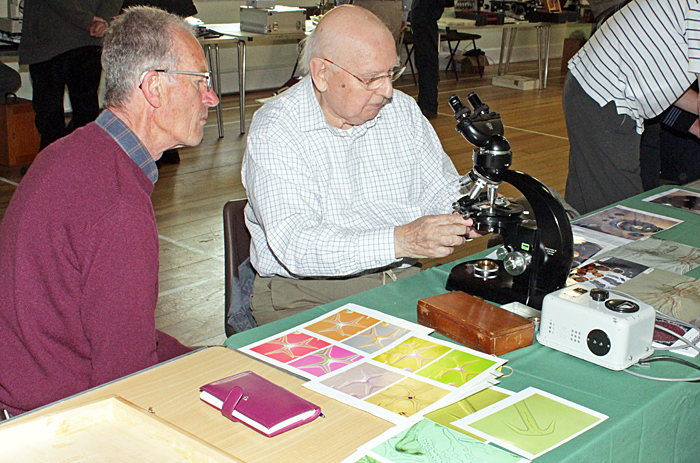 Mike was also promoting the Annual Exhibition of the Microscopy Section of the Northamptonshire Natural History Society on Sunday 24th June, where Mark Powell will demonstrate how to make slides of lichen. 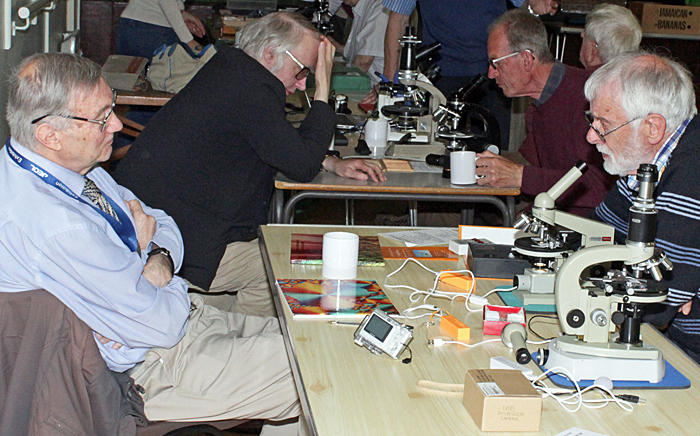 Mike Samworth brought a Nikon stereomicroscope so that we could examine 2 slides made by Doug Morgan, the oldest PMS member who had recently passed away aged 98. 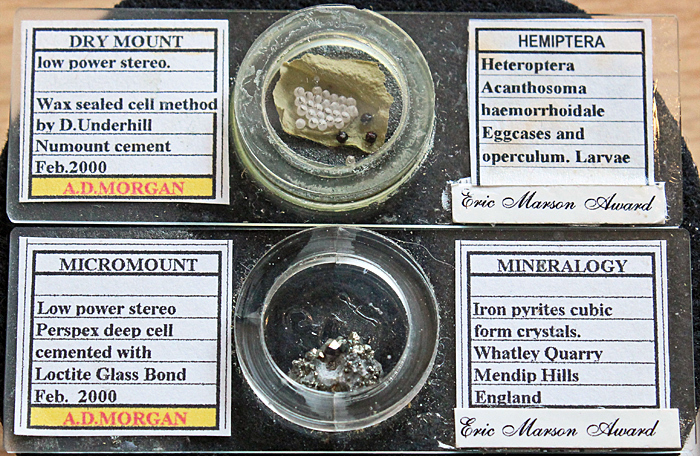 These 2 slides, of shield-bug egg cases and iron pyrite crystals, were labelled as having been made in February 2000 and having received the Eric Marson Award from the Quekett. 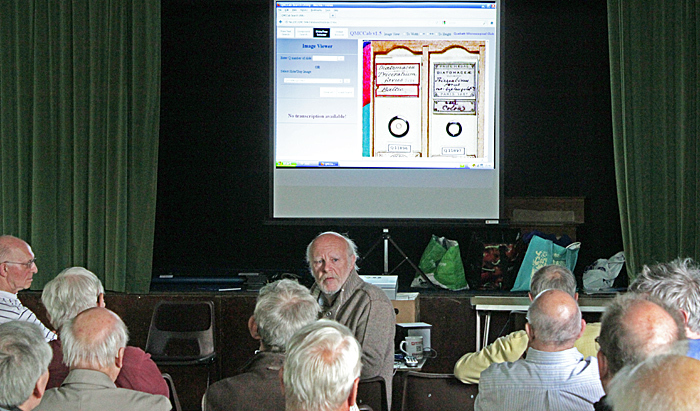 Ray Sloss was showing a Philip Harris stereomicroscope with a built-in camera connected to a laptop computer. 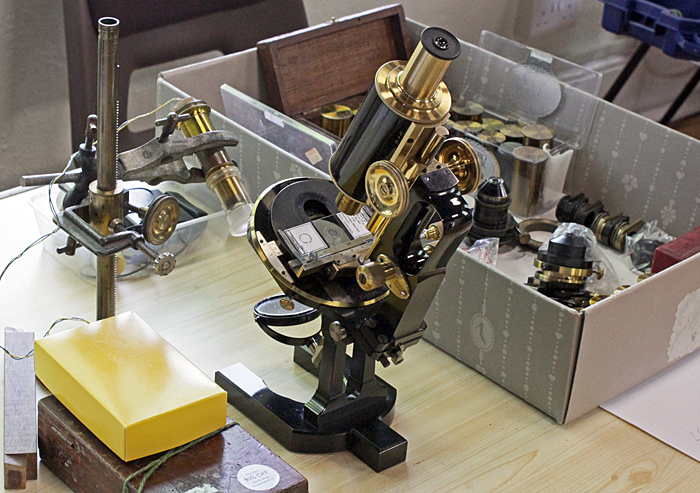 Stephen Parker brought his Leitz SM and Vickers M74 polarising microscopes (the latter fitted with a Wright eyepiece) so that we could examine his collection of thin sections of stromatolites. Stromatolites are the fossilised remains of mats of cyanobacteria (blue-green algae); most of them are just trace fossils, but a few in fine-grained chert show the remans of the cyanobacteria. 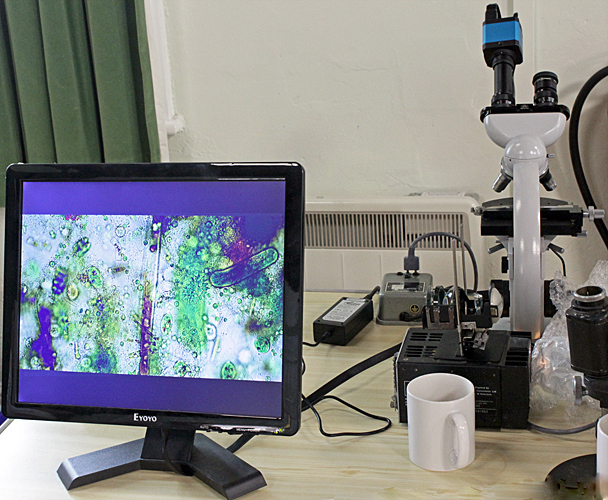 Steve Durr brought his Zeiss Standard and used a Chinese inspection camera with a C-mount to 23mm adapter replacing one of the eyepieces to show live pond life on an Eyoyo monitor. 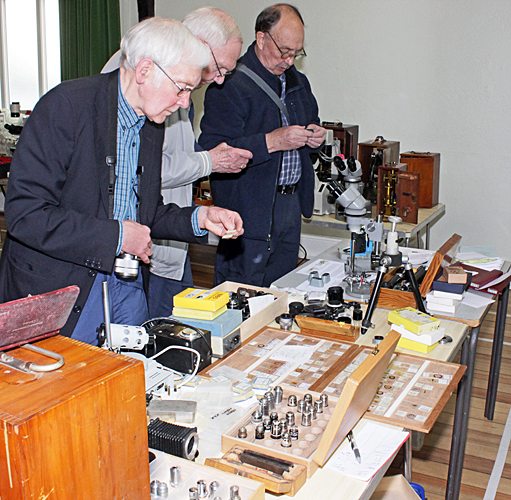 Colin Lamb was selling several items, including books, a macro stand made by John Nichols, an unbranded phase condenser, a black and chrome Zeiss monocular, a black and chrome J. Swift polarising microscope, and the bright-field/dark-field base of an Olympus JM gem microscope. 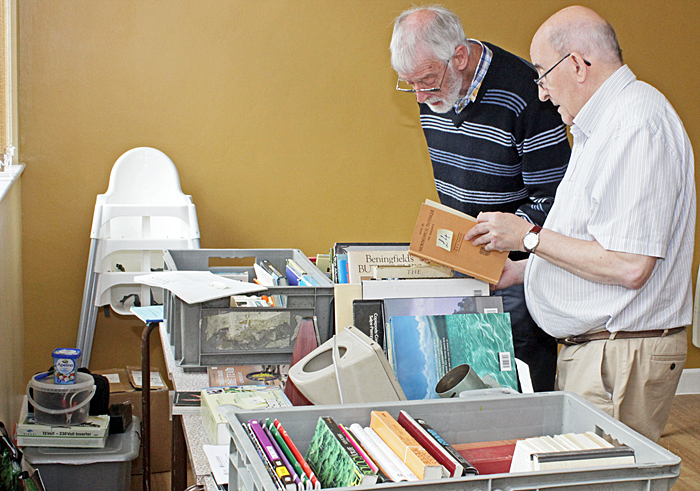 Geoff Mould was selling 2 centrifuges, a large laboratory jack, some electrical items and a range of books. John Judson’s main item was an Olympus CK inverted microscope (with binocular and trinocular heads and a mechanical stage that John had modified to fit. 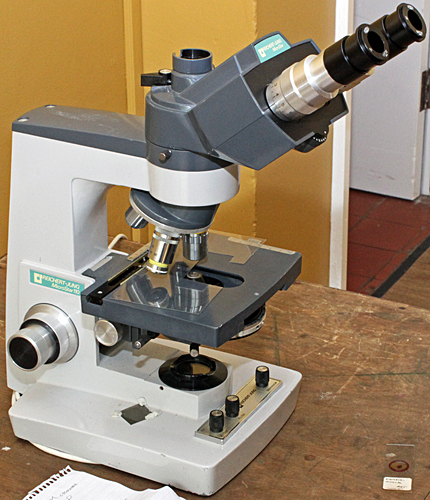 He also had bits from an Olympus IMT inverted microscope (the 20mm WD NA 0.55 phase condenser, and the slide-in annuli for the 55mm WD condenser), a Leitz demonstration head, some binocular and trinocular heads and a couple of mechanical stages. John Millham had some desirable microscopes, including trinocular Leitz Dialux 20 and Zeiss Standard that sold as soon as he put them out. 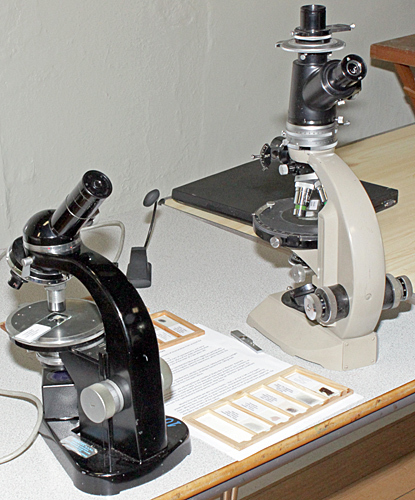 He also had two zoom stereo microscopes (a trinocular Euromex and a Nikon with transmitted-light base), two inverted microscopes (Nikon TMS and Olympus CK2), several other microscopes and lots of accessories. Lawrence Hartley has been buying books on his latest enthusiasm, microfossils, so he needed to dispose of some other books to make some space. He was also selling a metronome, parts of rear projectors, some brass sieves and a box full of video surveillance cameras and lenses. 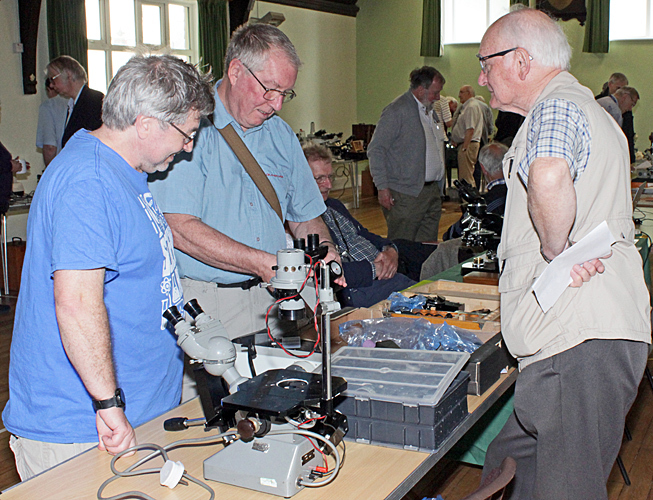 Mike Samworth was again sellings items from the estate of Steve Edgar, including Leitz and Zeiss objectives, lots of eyepieces and condensers, some enlarging lenses and odds and ends. He also had a Pentacon macro tripod, Lomo and Olympus illuminators, Biosil slides and back numbers of Balsam Post. 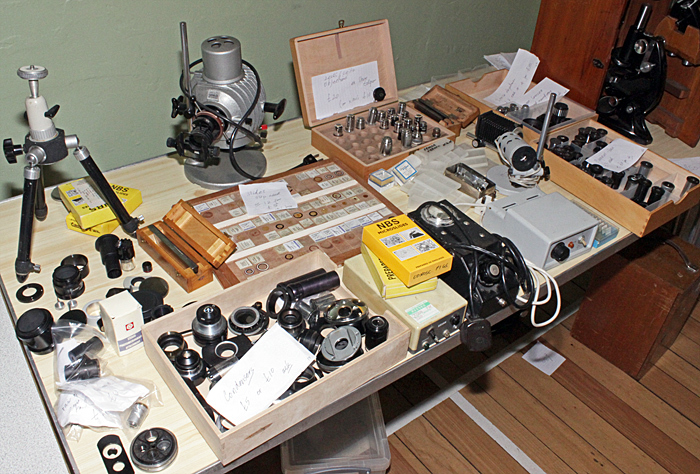 Steve Gill had several Watson microscopes (including a cream trinocular Bactil-60 and a purple binocular Bactil-60), a huge Watson exposure meter, some large and heavy Wild items, a Beck Diamax and a Bausch & Lomb. A trinocular Reichert-Jung MicroStar 110 from the estate of Les Larkman was also for sale. 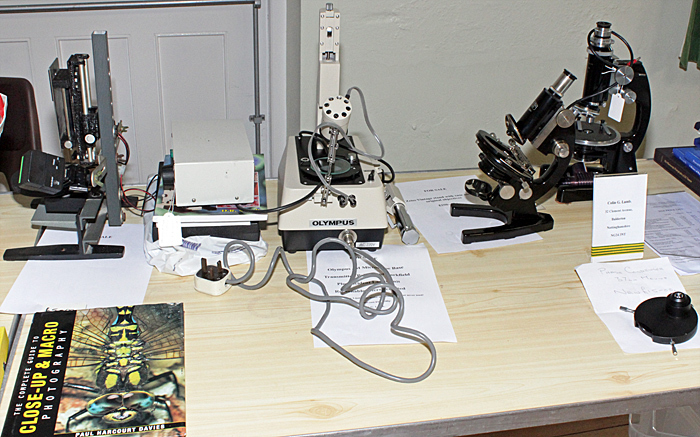 Mike Gibson spoke on “Through a glass darkly – a microscopical mystery tour”, showing us photos of his first microscope (Merit Student Microscope), his favourites (Lomo), a Gillett & Sibert projection microscope that enabled him to make drawings. He also showed us the cameras that he uses for photomicrography (a little Sony Cybershot for afocal work and a Canon digital SLR on an Olympus BH-2 linked to a computer), and lots of his photomicrographs. 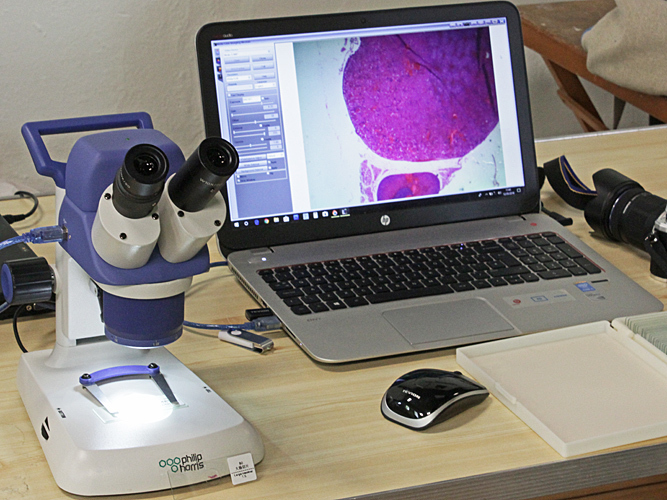 The photomicrographs included a huge range of specimens and techniques including Rheinberg illumination and crossed polarisers with retarders. Mike explained how he increases depth of field by image stacking, and increases field of view by image stitching using Microsoft ICE. He also told us about outreach in schools and in a UA3 microscope users group (MUG). 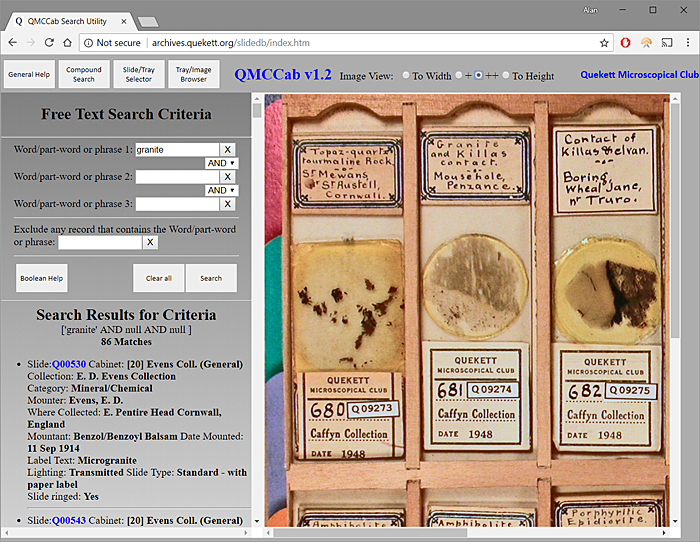 The Quekett needs volunteers to transcribe more of the data. If you are interested in helping, then please contact Steve or Contact the Club. 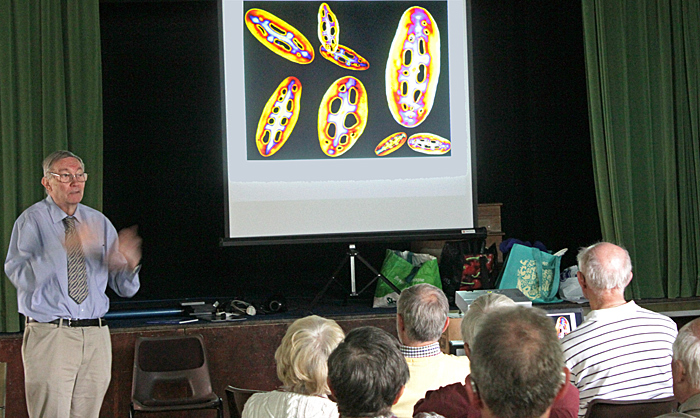 Mick Chaplin showed some videos “In memory of Doug Morgan” and about his own “Work in progress” on time-lapse videos, including the growth of crystals.